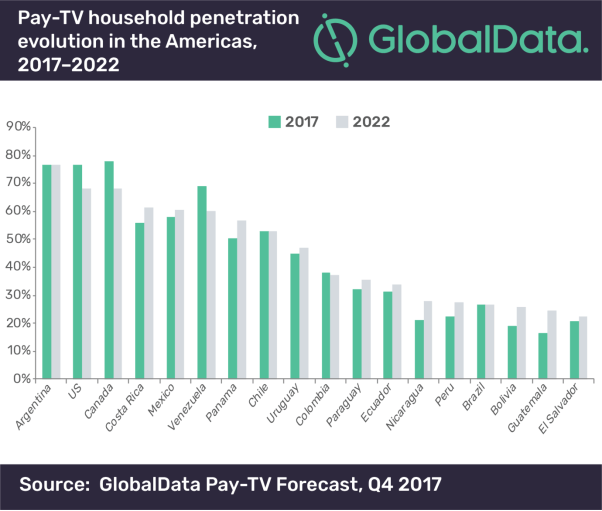 Pay-TV penetration in the Americas is set to decline through 2022 due to ongoing cord-cutting trends in North America, where an increasing number of households are swapping their traditional pay-TV subscriptions for over-the-top (OTT) alternatives, says GlobalData, a leading data and analytics company. In Latin America, where cord-cutting is still not affecting any markets yet, GlobalData expects subscriber growth to decelerate in the coming years. Pay-TV operators are also establishing partnerships with pure OTT players in order to enhance their content propositions, an option often combined with their proprietary OTT platforms. Netflix has become one of the most prolific OTT platforms in this regard, stablishing successful global and regional partnerships with some of the leading pay-TV players in both mature and emerging pay-TV markets.